Bernaise sauce is a sauce like Hollandaise sauce, and is an emulsion of clarified butter and egg yolk with the distinct flavoring of tarragon, shallots, and chervil. Called Sauce Béarnaise in French for the region in which it originated, the name is accurately spelled Bearnaise; however, it is frequently spelled Bernaise, leading to the mistaken assumption that it was named for the city of Bern in Switzerland. 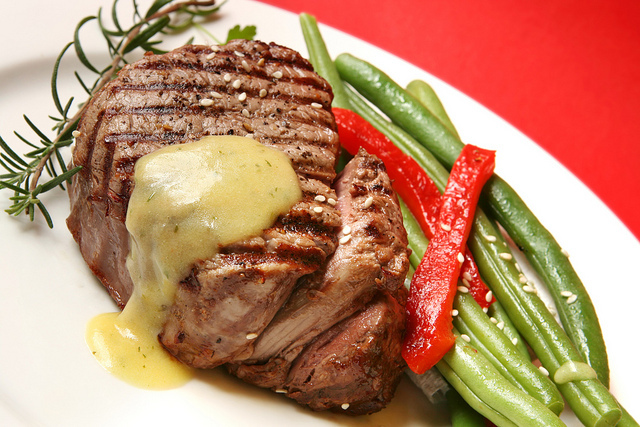 Bernaise sauce is best served with meat, poultry, or vegetables. Though several variations of recipes for Bernaise sauce exist, it is a difficult sauce to perfect because it requires special attention to avoid separation and curdling. When prepared properly, it is a smooth, creamy sauce. Crush the peppercorns. Combine with the wine, vinegar, shallots, tarragon, chervil and parsley in the top of a double-boiler. Cook over direct heat until reduced by half. Strain the mixture and allow to cool. Beating briskly, over -NOT IN- hot water, add, alternating between them, the egg yolks and the butter. Beat steadily so that all ingredients are combined. Season to taste. The sauce should have the consistency of Hollandaise sauce.